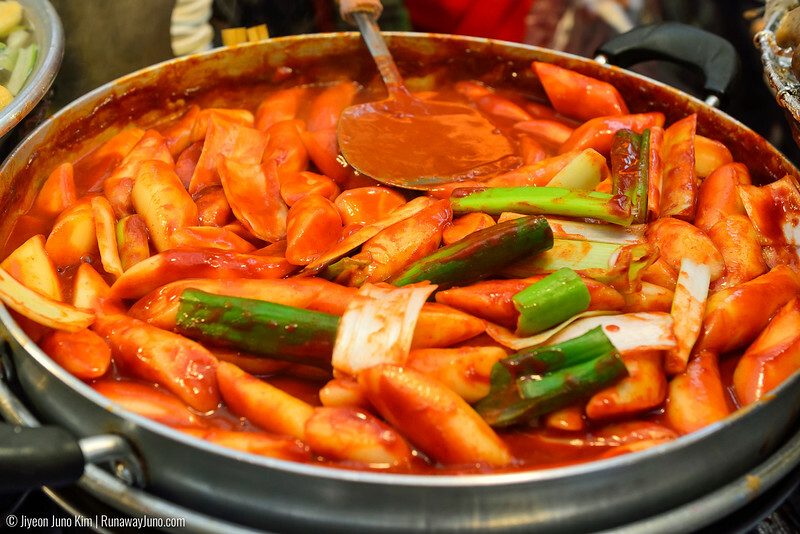 You might love Korean food, but you might not have heard of these three typical and unforgettable Korean dishes. Do you like Korean soap operas? I’ve met many people who are big fans of Korean TV programming over the years and the numbers are only growing. Whether you are a fan of dramas or variety shows, you may have noticed that Korean actors are eating all the time. They eat when they are on a date, at a family meeting, visiting a friend or just sitting on a park bench. Food is that important in Korean culture. Scenes from soap operas often take place in a normal Korean restaurant. The world is now getting to know Korean cuisines, such as bibimbap and bulgogi. However, there is still a food culture that is unknown to most non-Koreans. Thanks to Korean food/cooking shows, we can experience authentic Korean cuisine like never before, in our own homes. Made from the spine of a pig and chili pepper seasoning, Gamjatang is a popular Korean dish that can be traced back 2,000 years. The bone is boiled at a high temperature to soften the meat, and it just melts in your mouth because of that. It’s seasoned with chili pepper and cooked with ground sesame seeds, various vegetables, and potatoes. Funny thing about the name of this dish is that the direct translation would be “potato soup” (gamja = potato, tang = soup) but the potato is merely one of the ingredients. There’s no exact explanation about the origin, but some guess that the Korean word for potato, gamja, actually means part of the bones in the olden days. Gamjatang can be served at any time of day as a normal meal but is often eaten as a late night snack with soju, a Korean alcoholic drink. 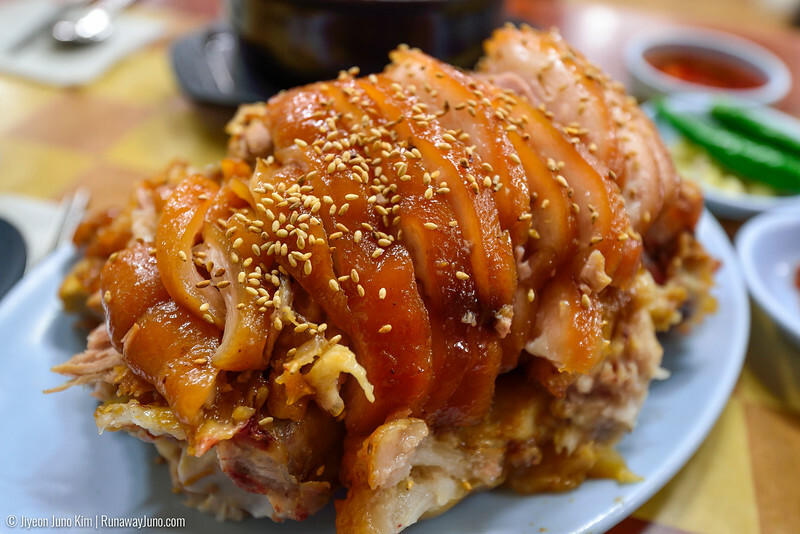 One of the most popular foods to accompany soju is pork knuckle or jokbal. It’s braised and boiled in a combination of soy sauce, ginger, garlic and various herbs. Once cooked, it’s de-boned and cut into thick slices. The bones are served with the meat, and biting the meat straight off the bones is part of the tradition. 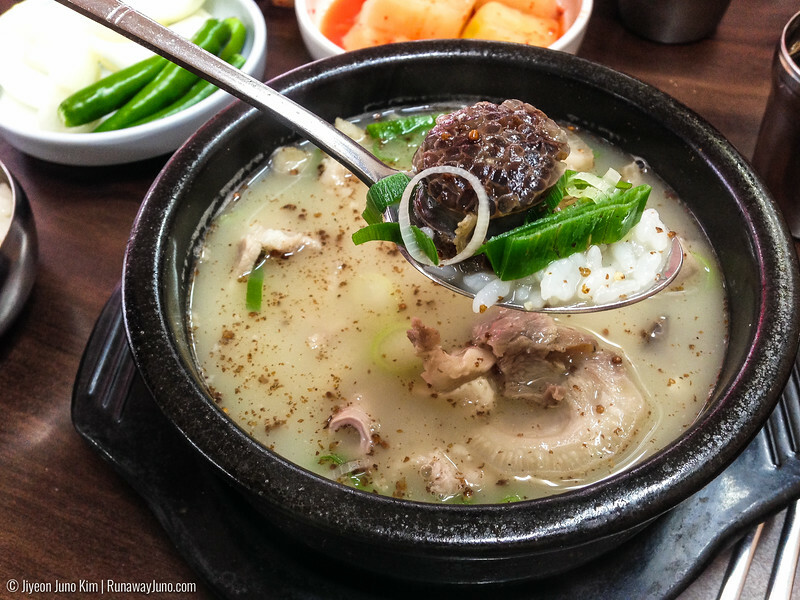 This dish is known to have originated from a neighborhood called Jangchung-dong, in Seoul, during the Korean War; and it’s been loved by the people of Korea for generations. Jokbal is frequently considered a unique food but, actually, pork legs are prepared around the world in various forms, especially in Europe. Schweinshaxe of Germany, Czech Republic and Poland also make this dish with pork legs. Finland has Mustamakkara, Scotland has haggis and Korea has sundae. Sundae (pronounced “soon-deh”) is cow or pig intestine stuffed with blood, meat, vegetables, noodles, and barley. It has been eaten since long ago. Cookbooks written in the Joseon period (19th century) mention pork sundae. Since then, each region in the country developed its own unique recipe or wrapping. 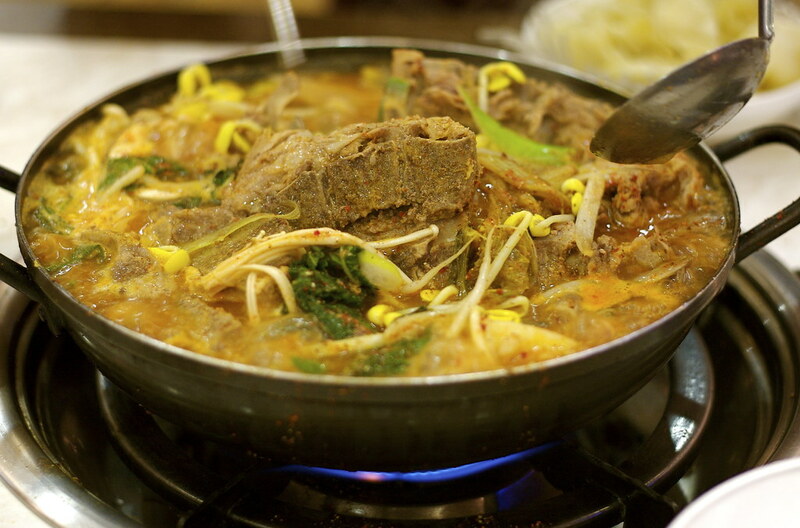 Sundaeguk (pronounced “soon-deh-gook”) is a soup-like dish made with a sundae and other parts of pork such as intestine, liver, lungs, cartilage and meat. It’s served in a broth made with cow or pig’s bones. Rich with fat and protein, it’s good to eat when you’re looking for extra energy. A lot of Koreans regularly eat sundaeguk to recharge their stamina. It’s served with kimchi, salty fermented shrimp, and ground sesame seeds. Sundaeguk can be found not only in most traditional markets around the country but also on any street with multiple restaurants. It’s one of the most widely loved foods in Korea. Want to win a trip to Korea? 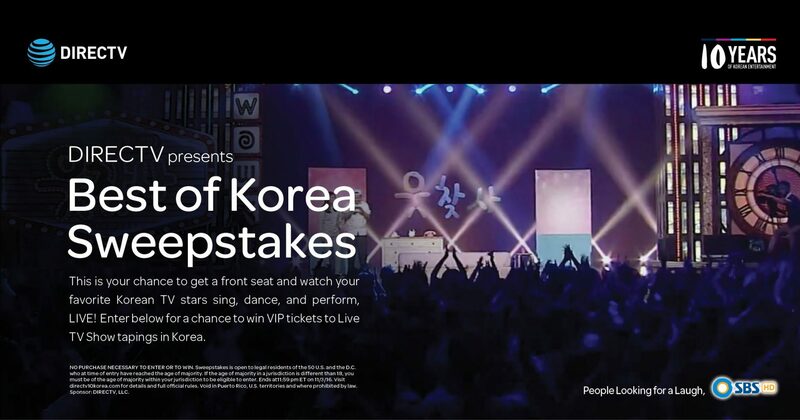 Whether you are a Korean in America, a Korean American wanting to visit your homeland or someone who simply wants to explore Korea, this is your chance to win! The “Best of Korea” sweepstakes is part of a grand celebration of DIRECTV’s 10th anniversary of Korean programming. DIRECTV also launched its latest SBS (Seoul Broadcasting System) HD channel in September. The holidays are also approaching so we have so much to celebrate! The grand prize winner will get to experience the best Korean entertainment only DIRECTV can provide, live in Korea! • Enter your information (i.e., First and Last Name and E-mail Address) and complete all of the required fields on the sweepstakes entry form.